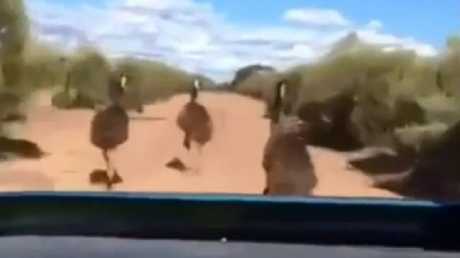 DISTURBING dashcam footage in Western Australia appears to show five emus being chased down and apparently deliberately run over by a speeding four-wheel-drive. The footage, which aired on Perth's Channel 7 News last night, was first posted to social media. 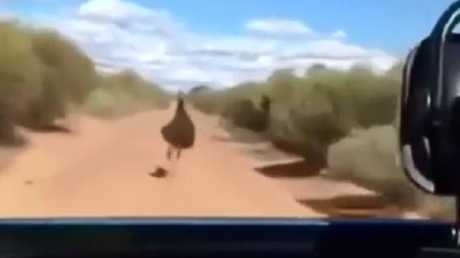 It shows a vehicle in the outback pursuing the flightless birds as they run for their lives. 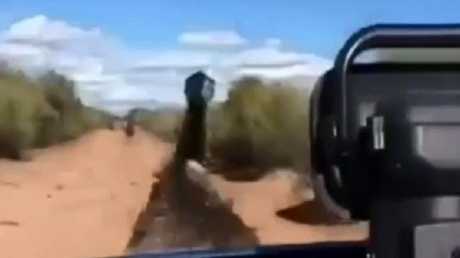 The car swerves to stay on track with the emus and then, one-by-one, mows them down. There is no information to identify when the incident happened or where it took place - or even if it was WA at all. Animal protection charity, the RSPCA, said they were appalled by the footage. "We are distressed to see what appears to be deliberate running down of emus," a statement said, reported in the West Australian. "The video has been sent to us and we will be investigating. This kind of cruelty to animals is appalling and unacceptable." It's not the first time WA wildlife has been injured at the hands of reckless humans. In 2003, several quokkas were found kicked to death on Rottnest Island, off the coast of Perth, apparently as part of a sadistic game known as "quokka soccer". Last year, video emerged a man kicking a quokka on the island, which has a large a colony of the marsupials that regularly charm tourists. The video showed a man chasing the quokka and kicking it twice, once into a wall. The RSPCA said it was "absolutely horrified" by the video. Two men were charged with cruelty to animals. The RSPCA has asked anyone who may know more about the emu's plight to call the Cruelty Line on 1300 278 3589.